"Load me up with points, boys! Load me up with rockets! Place these lights that make it harder to hide!" Items are carryable objects. 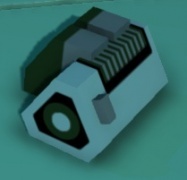 Most can be purchased at any time by Robosaru, provided a Dropship exists, while Bunnies may only purchase them while inside the Dropship proper. 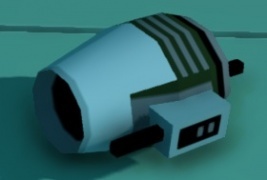 Shop-bought items are delivered to the game field via the Dropship. They can be picked up and used by Bunnies with Action, and they can be dropped with Drop. Any item, when placed in the Feed Box, will be removed from play. 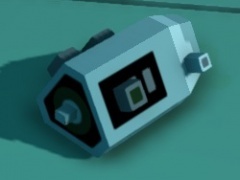 Robosaru's weapons also have the ability to destroy dropped and placed items alike. All items are solid: They obstruct the Bunny's movement, Robosaru's weapons, and Sentry shock arcs. Placeable items are inert until a Bunny picks them up and places them. These items can be placed when in a Bunny's mouth by pressing the Action key. Placeable items display a hologram visible to the Bunny when held in the mouth displaying as to where they will be placed. After being set up, placeable items are immobile and can only be uprooted by Robosaru, by aiming at them and pressing Next. 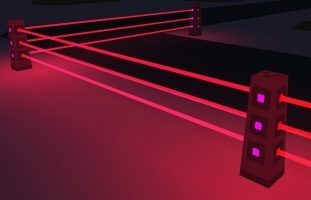 Laser Walls are placeable items costing 70¢, and are purchased as single poles. Two poles placed in a row will generate a deadly beam that will turn any Bunnies who touch it into corpses. Placed poles will lock to a grid, and will generate a beam to any pole in a cardinal direction that is within 9 units. Beams between Laser Walls regenerate every time a new Laser Wall is placed somewhere in the map, or uprooted by Robosaru. 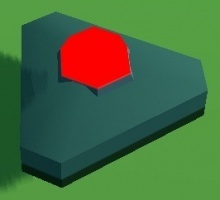 If there is an obstruction at least 2 Uranium high between two Laser Walls when the beam is to be regenerated, the beam between those two Laser Walls will not generate. The beam will regenerate again the next time a regeneration occurs if the obstruction is removed. 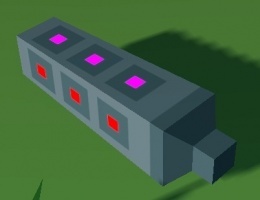 Carrying or setting up a Laser Wall near the Feed Box is often seen as a form of disOBEYing, since it can lead to corpses ending up near the Feed Box. 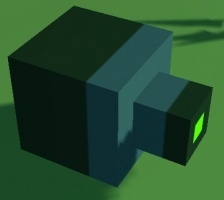 Laser Walls cannot be placed too close to a Sentry. Mines are placeable items costing 100¢. Mines are visible when inactive, but once placed, will be invisible to all players. 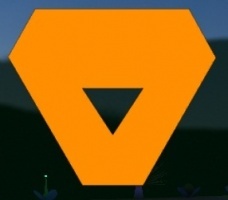 The mine will display a trigger area to Robosaru and Spectators only. 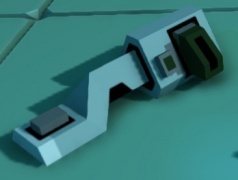 The mine will arm 9 seconds after being placed. 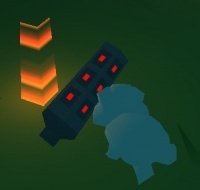 If a Bunny wanders into the trigger zone, the mine will explode, taking with it the unfortunate bunny who stumbled onto it, as well as any items and bunnies standing close by. Mines cannot be placed too close to a Sentry. Lights are placeable items costing 70¢. 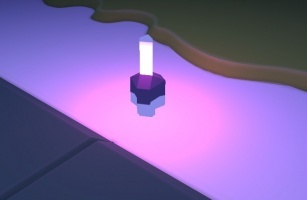 They illuminate a small area with a purplish light when placed. 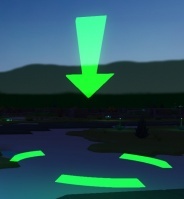 Lights cannot be placed too close to a Sentry. Sensors are placeable items costing 100¢. When placed, their decals change color from cyan to red, and their function changes. Sensors have two different functions: Listening while unplaced, and watching while placed. Unplaced, sensors can be picked up and carried about like any other item. Any whispers sent within 5 units of an unplaced sensor will automatically be intercepted by Robosaru. Sensors continue to listen even while inside the Dropship or while being carried by a Bunny. If a bunny walks within 5 units of a placed sensor, the sensor will audibly beep for nearby bunnies and display a flashing exclamation mark above itself. 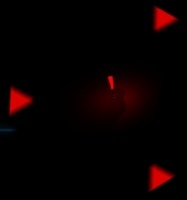 The player in Robosaru will always hear the beeping sensor, and will be alerted to its location by a large, red, rotating reticule. Sensors will also be set off by the presence of a large corpse. After being placed, a sensor will be inactive for 6 seconds. A good indication of when activation occurs is when the red lights on the sensor flash on for the third time. Sensors cannot be placed too close to a Sentry. The primary purpose of Robosaru Resources is to be placed into the Feed Box. Doing so will automatically drop money equivalant to the current autopay next to the Bunny that delivered the item. However, these items are also considerably heavy, and as consumables, tend to be purchased frequently. This makes them ideal items for sabotaging the Dropship. 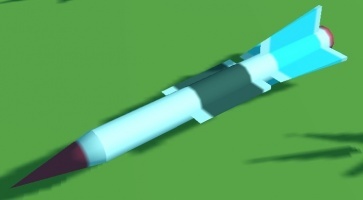 Missiles are an inert item costing 50¢. 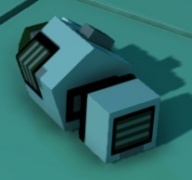 When placed in the Feed Box, 6 shots will be loaded into Robosaru which can be fired with the Drop key. Loading Missiles into the Feed Box will drop money for the depositing Bunny if Autopay has been set. Missiles are volatile and will explode if caught within another explosion's radius. Batteries are an inert item costing 150¢. 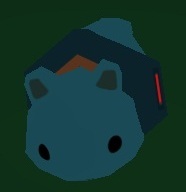 When placed in the Feed Box, they will be loaded into Robosaru. 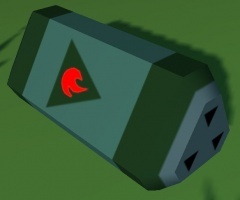 Each Battery provides a single charge for Robosaru's Sentries. Loading Batteries into the Feed Box will drop money for the depositing Bunny if Autopay has been set. Fuel is an inert item costing 150¢. 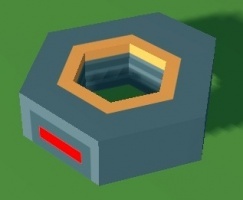 When placed in the Feed Box, 4 flamethrower ammo will be loaded into Robosaru, which can then be used with the Flame key. 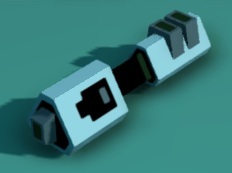 4 flamethrower ammo provides just over a second of uninterrupted flamethrower usage. Loading Fuel into the Feed Box will drop money for the depositing Bunny if Autopay has been set. Fuel is volatile and will explode if caught within another explosion's radius. Uranium is an inert item costing 100¢. 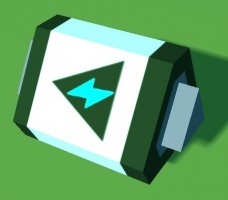 When placed in the Feed Box, it generates 300¢ for the player currently controlling Robosaru. Loading Uranium into the Feed Box will drop money for the depositing Bunny if Autopay has been set. If no autopay is set, the player controlling Robosaru will earn a 200¢ net profit if they were the one to purchase the Uranium. If autopay is set to maximum (100¢), they will earn 100¢ net profit. 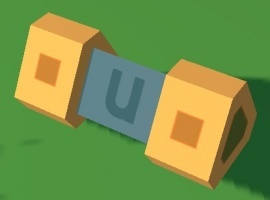 As the heaviest item, and the item with the highest Weight:Cost ratio, Uranium is frequently purchased by Bunnies for the purpose of sabotaging the Dropship. Scrap is an inert item that cannot be purchased from the buy menu. Scrap spawns inside the Dropship whenever a bunny is spawn killed, and also spawns at the crash site of a Dropship. Scrap supplies Robosaru with a small money bonus when delivered to the Feed Box, in addition to dropping autopay for the bunny who does so. Scrap comes in three different sizes: Small, Medium, and Large. Small scrap is worth 25¢ when placed in the Feed Box, Medium scrap is worth 50¢ and Large scrap 75¢. Do note that if Autopay is higher than the value of the Scrap being deposited, Robosaru can be bled for cash. 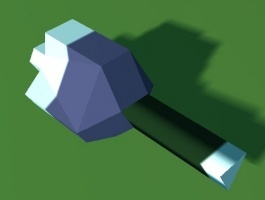 Scrap is considerably heavy, Large Scrap being the second heaviest item in the game with a mass three quarters that of Uranium. Another noteworthy feature is that Large Scrap parts are also the largest items in the game, very easily concealing a bunny on their own. Pointers are a Bunny usable item costing 40¢. 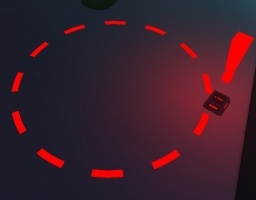 When activated by a bunny using the Action key, they display a marker at the targeted location that is visible to all players and Robosaru, much akin to Directives. Pointers are infinite use, but do require a short period of time after each use to recharge. This recharge period is localized to each pointer, so a Bunny can indicate multiple locations within a short period of time by using multiple pointers. Since bunnies have better vision than Robosaru, they are often used as a spotting device to alert Robosaru of disOBEYing bunnies. Collars are a passive item costing 40¢. They show an orange arrow above them to only Robosaru at all times, to allow tracking of their location. Robosaru can detonate any collar by targeting it and by pressing Prev. If the Collar is being worn or held by a bunny at the time, the bunny will die. Collars increase the income to 10¢ per two seconds for the Bunny who is holding or wearing one. This bonus does not apply inside the Dropship, and it does not stack. The Collar also provides the Bunny immunity from Sentry shocks, but not from the electric field generated upon a subversion. Collars are automatically given to all Bunnies whenever Robosaru is subverted. Bunnies who are already collared, inside the Dropship, or are too close to Sentries are not given a collar. A lack of a collar is generally regarded as the most definite sign that a bunny is disOBEYing. 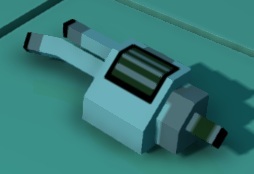 Charred Corpses are inert objects that cannot be purchased from the buy menu. They occur whenever a bunny is killed by lasers, electricity or fire. Because of this, the initial spawning of a corpse will always be accompanied by a small fire. 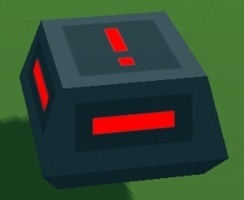 When placed in the Feed Box, a crippling amount of money is deducted from the bank of the player controlling Robosaru. Corpses come in two sizes, small and large. The small corpses are just the body or the head, and deduct 1000¢. The large is the corpse of the whole bunny, which deducts 1500¢. Whenever a corpse is generated, there is a 25% chance for just the head dropping, 25% for the body, 25% for the full carcass, and 25% for both the head and the body spawning separately. Carrying corpses, especially near the Feed Box, is generally regarded as a sign of disOBEYing.
! Signs, or just "Signs", were a placeable item costing 15¢. They displayed a large, holographic exclamation mark above them that was easily visible to ALL players, not just Robosaru. 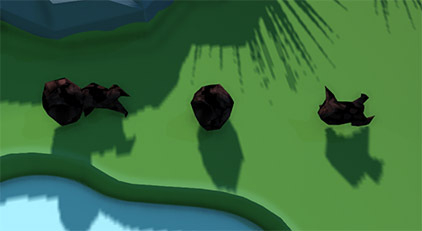 The tutorial described these for usage to warn bunnies about a mine-ridden area, or to be used as bluffs. Signs were replaced by Sensors in version 28r0. This page was last modified on 3 September 2015, at 08:32. This page has been accessed 83,318 times.